In a two pulley system, the belt can either drive the pulleys normally in one direction (the same if on parallel shafts), or the belt may be crossed, so that the direction of the driven shaft is reversed (the opposite direction to the driver if on parallel shafts). As a source of motion, a conveyor belt is one application where the belt is adapted to carry a load continuously between two points. The mechanical belt drive, using a pulley machine, was first mentioned in the text the Dictionary of Local Expressions by the Han Dynasty philosopher, poet, and politician Yang Xiong (53–18 BC) in 15 BC, used for a quilling machine that wound silk fibers on to bobbins for weavers' shuttles. The belt drive is an essential component to the invention of the spinning wheel. The belt drive was not only used in textile technologies, it was also applied to hydraulic-powered bellows dated from the 1st century AD. Belts are the cheapest utility for power transmission between shafts that may not be axially aligned. Power transmission is achieved by specially designed belts and pulleys. The demands on a belt-drive transmission system are huge, and this has led to many variations on the theme. They run smoothly and with little noise, and cushion motor and bearings against load changes, albeit with less strength than gears or chains. However, improvements in belt engineering allow use of belts in systems that only formerly allowed chains or gears. where, μ is the coefficient of friction, and α is the angle (in radians) subtended by contact surface at the centre of the pulley. Belt drives are simple, inexpensive, and do not require axially aligned shafts. They help protect machinery from overload and jam, and damp and isolate noise and vibration. Load fluctuations are shock-absorbed (cushioned). They need no lubrication and minimal maintenance. They have high efficiency (90–98%, usually 95%), high tolerance for misalignment, and are of relatively low cost if the shafts are far apart. Clutch action is activated by releasing belt tension. Different speeds can be obtained by stepped or tapered pulleys. The angular-velocity ratio may not be constant or equal to that of the pulley diameters, due to slip and stretch. However, this problem has been largely solved by the use of toothed belts. Working temperatures range from −31 °F (−35 °C) to 185 °F (85 °C). Adjustment of center distance or addition of an idler pulley is crucial to compensate for wear and stretch. Flat belts were widely used in the 19th and early 20th centuries in line shafting to transmit power in factories. They were also used in countless farming, mining, and logging applications, such as bucksaws, sawmills, threshers, silo blowers, conveyors for filling corn cribs or haylofts, balers, water pumps (for wells, mines, or swampy farm fields), and electrical generators. Flat belts are still used today, although not nearly as much as in the line-shaft era. The flat belt is a simple system of power transmission that was well suited for its day. It can deliver high power at high speeds (500 hp at 10,000 ft/min, or 373 kW at 51 m/s), in cases of wide belts and large pulleys. But these wide-belt-large-pulley drives are bulky, consuming lots of space while requiring high tension, leading to high loads, and are poorly suited to close-centers applications, so V-belts have mainly replaced flat belts for short-distance power transmission; and longer-distance power transmission is typically no longer done with belts at all. For example, factory machines now tend to have individual electric motors. Flat belts were traditionally made of leather or fabric. Today most are made of rubber or synthetic polymers. Grip of leather belts is often better if they are assembled with the hair side (outer side) of the leather against the pulley, although some belts are instead given a half-twist before joining the ends (forming a Möbius strip), so that wear can be evenly distributed on both sides of the belt. Belts ends are joined by lacing the ends together with leather thonging (the oldest of the methods), steel comb fasteners and/or lacing, or by gluing or welding (in the case of polyurethane or polyester). Flat belts were traditionally jointed, and still usually are, but they can also be made with endless construction. In the mid 19th century, British millwrights discovered that multi-grooved pulleys connected by ropes outperformed flat pulleys connected by leather belts. Wire ropes were occasionally used, but cotton, hemp, manila hemp and flax rope saw the widest use. Typically, the rope connecting two pulleys with multiple V-grooves was spliced into a single loop that traveled along a helical path before being returned to its starting position by an idler pulley that also served to maintain the tension on the rope. Sometimes, a single rope was used to transfer power from one multiple-groove drive pulley to several single- or multiple-groove driven pulleys in this way. 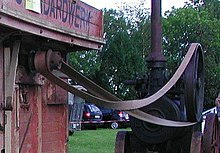 In general, as with flat belts, rope drives were used for connections from stationary engines to the jack shafts and line shafts of mills, and sometimes from line shafts to driven machinery. Unlike leather belts, however, rope drives were sometimes used to transmit power over relatively long distances. Over long distances, intermediate sheaves were used to support the "flying rope", and in the late 19th century, this was considered quite efficient. Spring belts are similar to rope or round belts but consist of a long steel helical spring. They are commonly found on toy or small model engines, typically steam engines driving other toys or models or providing a transmission between the crankshaft and other parts of a vehicle. The main advantage over rubber or other elastic belts is that they last much longer under poorly controlled operating conditions. The distance between the pulleys is also less critical. Their main disadvantage is that slippage is more likely due to the lower coefficient of friction. The ends of a spring belt can be joined either by bending the last turn of the helix at each end by 90 degrees to form hooks, or by reducing the diameter of the last few turns at one end so that it "screws" into the other end. V belts (also style V-belts, vee belts, or, less commonly, wedge rope) solved the slippage and alignment problem. It is now the basic belt for power transmission. They provide the best combination of traction, speed of movement, load of the bearings, and long service life. They are generally endless, and their general cross-section shape is roughly trapezoidal (hence the name "V"). The "V" shape of the belt tracks in a mating groove in the pulley (or sheave), with the result that the belt cannot slip off. The belt also tends to wedge into the groove as the load increases—the greater the load, the greater the wedging action—improving torque transmission and making the V-belt an effective solution, needing less width and tension than flat belts. V-belts trump flat belts with their small center distances and high reduction ratios. The preferred center distance is larger than the largest pulley diameter, but less than three times the sum of both pulleys. Optimal speed range is 1,000–7,000 ft/min (300–2,130 m/min). V-belts need larger pulleys for their thicker cross-section than flat belts. V-belts may be homogeneously rubber or polymer throughout, or there may be fibers embedded in the rubber or polymer for strength and reinforcement. The fibers may be of textile materials such as cotton, polyamide (such as Nylon) or polyester or, for greatest strength, of steel or aramid (such as Technora, Twaron or Kevlar). When an endless belt does not fit the need, jointed and link V-belts may be employed. Most models offer the same power and speed ratings as equivalently-sized endless belts and do not require special pulleys to operate. A link v-belt is a number of polyurethane/polyester composite links held together, either by themselves, such as Fenner Drives' PowerTwist, or Nu-T-Link (with metal studs). These provide easy installation and superior environmental resistance compared to rubber belts and are length-adjustable by disassembling and removing links when needed. Trade journal coverage of V-belts in automobiles from 1916 mentioned leather as the belt material, and mentioned that the V angle was not yet well standardized. The endless rubber V-belt was developed in 1917 by John Gates of the Gates Rubber Company. Multiple-V-belt drive was first arranged a few years later by Walter Geist of the Allis-Chalmers corporation, who was inspired to replace the single rope of multi-groove-sheave rope drives with multiple V-belts running parallel. Geist filed for a patent in 1925, and Allis-Chalmers began marketing the drive under the "Texrope" brand; the patent was granted in 1928 (U.S. Patent 1,662,511). The "Texrope" brand still exists, although it has changed ownership and no longer refers to multiple-V-belt drive alone. A multi-groove, V-Ribbed, or polygroove belt is made up of usually between 3 and 24 "V" shaped sections alongside each other. This gives a thinner belt for the same drive surface, thus it is more flexible, although often wider. The added flexibility offers an improved efficiency, as less energy is wasted in the internal friction of continually bending the belt. In practice this gain of efficiency causes a reduced heating effect on the belt, and a cooler-running belt lasts longer in service. Belts are commercially available in several sizes, with usually a 'P' (sometimes omitted) and a single letter identifying the pitch between grooves. The 'PK' section with a pitch of 3.56 mm is commonly used for automotive applications. A further advantage of the polygroove belt that makes them popular is that they can run over pulleys on the ungrooved back of the belt. Though this is sometimes done with V-belts with a single idler pulley for tensioning, a polygroove belt may be wrapped around a pulley on its back tightly enough to change its direction, or even to provide a light driving force. Any V-belt's ability to drive pulleys depends on wrapping the belt around a sufficient angle of the pulley to provide grip. Where a single-V-belt is limited to a simple convex shape, it can adequately wrap at most three or possibly four pulleys, so can drive at most three accessories. Where more must be driven, such as for modern cars with power steering and air conditioning, multiple belts are required. As the polygroove belt can be bent into concave paths by external idlers, it can wrap any number of driven pulleys, limited only by the power capacity of the belt. A ribbed belt is a power transmission belt featuring lengthwise grooves. It operates from contact between the ribs of the belt and the grooves in the pulley. Its single-piece structure is reported to offer an even distribution of tension across the width of the pulley where the belt is in contact, a power range up to 600 kW, a high speed ratio, serpentine drives (possibility to drive off the back of the belt), long life, stability and homogeneity of the drive tension, and reduced vibration. The ribbed belt may be fitted on various applications: compressors, fitness bikes, agricultural machinery, food mixers, washing machines, lawn mowers, etc. Though often grouped with flat belts, they are actually a different kind. They consist of a very thin belt (0.5–15 millimeters or 100–4000 micrometres) strip of plastic and occasionally rubber. They are generally intended for low-power (less than 10 watts), high-speed uses, allowing high efficiency (up to 98%) and long life. These are seen in business machines, printers, tape recorders, and other light-duty operations. Timing belts (also known as toothed, notch, cog, or synchronous belts) are a positive transfer belt and can track relative movement. These belts have teeth that fit into a matching toothed pulley. When correctly tensioned, they have no slippage, run at constant speed, and are often used to transfer direct motion for indexing or timing purposes (hence their name). They are often used instead of chains or gears, so there is less noise and a lubrication bath is not necessary. Camshafts of automobiles, miniature timing systems, and stepper motors often utilize these belts. Timing belts need the least tension of all belts and are among the most efficient. They can bear up to 200 hp (150 kW) at speeds of 16,000 ft/min (4,900 m/min). Disadvantages include a relatively high purchase cost, the need for specially fabricated toothed pulleys, less protection from overloading, jamming, and vibration due to their continuous tension cords, the lack of clutch action (only possible with friction-drive belts), and the fixed lengths, which do not allow length adjustment (unlike link V-belts or chains). Belts used for rolling roads for wind tunnels can be capable of 250 km/h (160 mph). The open belt drive has parallel shafts rotating in the same direction, whereas the cross-belt drive also bears parallel shafts but rotate in opposite direction. The former is far more common, and the latter not appropriate for timing and standard V-belts unless there is a twist between each pulley so that the pulleys only contact the same belt surface. Nonparallel shafts can be connected if the belt's center line is aligned with the center plane of the pulley. Industrial belts are usually reinforced rubber but sometimes leather types. Non-leather, non-reinforced belts can only be used in light applications. power [kW] = (torque [N·m]) × (rotational speed [rev/min]) × (2π radians) / (60 s × 1000 W). Factors of power adjustment include speed ratio; shaft distance (long or short); type of drive unit (electric motor, internal combustion engine); service environment (oily, wet, dusty); driven unit loads (jerky, shock, reversed); and pulley-belt arrangement (open, crossed, turned). These are found in engineering handbooks and manufacturer's literature. When corrected, the power is compared to rated powers of the standard belt cross-sections at particular belt speeds to find a number of arrays that perform best. Now the pulley diameters are chosen. It is generally either large diameters or large cross-section that are chosen, since, as stated earlier, larger belts transmit this same power at low belt speeds as smaller belts do at high speeds. To keep the driving part at its smallest, minimal-diameter pulleys are desired. 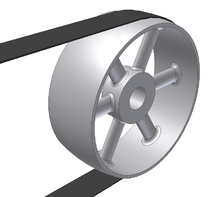 Minimum pulley diameters are limited by the elongation of the belt's outer fibers as the belt wraps around the pulleys. Small pulleys increase this elongation, greatly reducing belt life. Minimal pulley diameters are often listed with each cross-section and speed, or listed separately by belt cross-section. After the cheapest diameters and belt section are chosen, the belt length is computed. If endless belts are used, the desired shaft spacing may need adjusting to accommodate standard-length belts. It is often more economical to use two or more juxtaposed V-belts, rather than one larger belt. Common pulley design is to have a higher angle of the first part of the opening, above the so called "pitch line". Lariat chain – a science exhibit showing the effects when a belt is run "too fast"
Wikimedia Commons has media related to Belt drives. ^ Needham (1988), Volume 5, Part 9, 207–208. ^ a b Needham (1986), Volume 4, Part 2, 108. ^ Needham (1988), Volume 5, Part 9, 160–163. ^ By Rhys Jenkins, Newcomen Society, (1971). Links in the History of Engineering and Technology from Tudor Times, Ayer Publishing. Page 34, ISBN 0-8369-2167-4. ^ James N. Boblenz. "How to lace a flat belt". Farm Collector. Retrieved 2010-04-04. ^ "Belt lacing patterns" (PDF). North Dakota Statue Univ. ^ "Flat Belt Pulleys, Belting, Splicing". Hit N Miss Enterprises. Archived from the original on 17 March 2010. Retrieved 2010-04-04. ^ Robert Grimshaw, Drive for Power Transmission Cassier's Magazine Vol. II, No. 9 (July 1892); pages 219–224. ^ John J. Flather, Rope-Driving: A treatise on the transmission of power by means of fibrous ropes, Wiley, New York, 1895. ^ A Modern Cement Plant Installation, Power and Transmission. Vol. XVIII, No. 1 (Oct. 1902); pages 17–19 and 29. Note: This journal is the house organ of the Dodge Manufacturing Company and is mostly devoted rope-power systems. ^ Editorial staff (1916-04-15), "Radiator fans and their design", Horseless Age, 37 (8): 324. ^ Editorial staff (1916-04-15), "S.A.E. divisions exhibit activity", Horseless Age, 37 (8): 322. ^ "Gates Belt I.D. Chart" (PDF). ^ a b Automotive Handbook (3rd ed.). Robert Bosch GmbH. 1993. p. 304. ISBN 0-8376-0330-7. ^ "Pininfarina Aerodynamic and Aeroacoustic Research Center". Arc.pininfarina.it. Retrieved 2009-10-24.